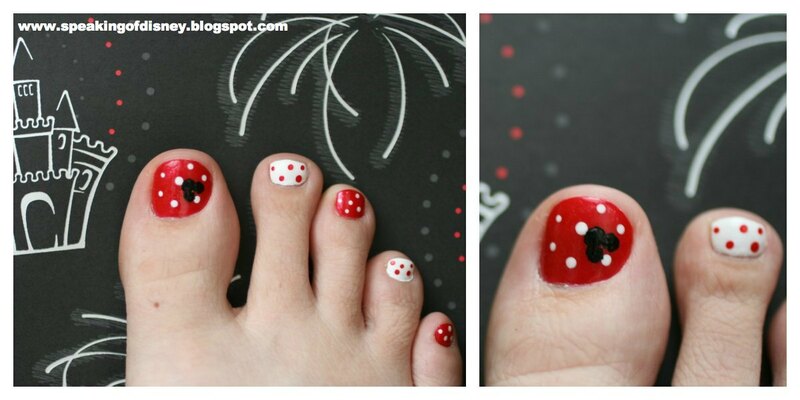 I wanted to have some silly Disney fun during a girls trip to one of the local nail salons, so I decided to have a Mickey & Minnie Mouse pedicure! After looking through many pictures on the web of Disney “nail art”, I choose to combine several ideas to create my own design. I had never had nail art on my toes before other then a single tiny flower when we vacationed on the beaches of Thailand, so I was interested to see how they would accomplish making my creation based off a few pictures and a verbal description. Everything went well until we got to the Mickey part. I had a feeling that the language barrier was causing a little confusion based on their facial expressions so I did my best to continue to describe my idea. After everything was said and done, I must say that love how my toes turned out and hope they inspire you during your next trip to the nail salon! For the red, I selected the new OPI Minnie Mouse collection’s “Color of Minnie”. The white and black were just some standard nail polishes housed at the nail salon. ← Great Disney Savings on Rooms for Fall Bookings! Thank you Disney Moms for sharing my article! This is so exciting!!!! Tres cute and tres chic. My niece is a Minnie Mouse fan. Prepare for shrieks of joy when I show up with this web page and 3 bottles of nail polish.